Wild Wild West Coupon is an advertising-supported application which will show you various commercial advertisements regardless of the type of your default browser. As you can see, this program will not provide you with the best coupons, deals, and promo codes; thus, we advise you not to keep useless applications on the system. The removal of Wild Wild West Coupon will help you to avoid malicious software as well, which is why you should not postpone this process. If you are already ready to delete Wild Wild West Coupon from the system, scroll down and find the manual removal instructions placed below the article. If you wonder why you should get rid of this program, you should know that it is very risky to keep it on the system because it might even expose you to different kinds of threats. Actually, Wild Wild West Coupon is not a very bad program; however, commercial ads that it generates might still route you to corrupted websites. This advertising-supported application does not monitor the content of these websites in any way because it just uses the service provided by third-party advertisers. Of course, it is your choice whether you want to keep Wild Wild West Coupon on the system. However, we recommend eliminating it as soon as possible. 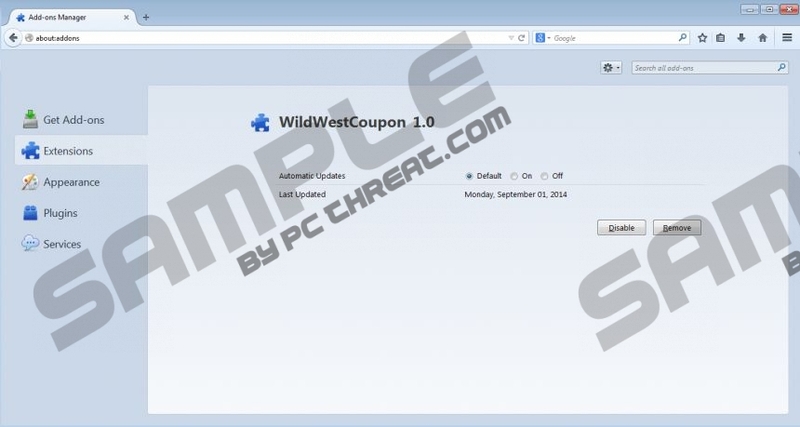 The research carried out by the specialists of pcthreat.com has shown that Wild Wild West Coupon is capable of randomizing its name in order not to be detected very easily. Thus, it might be rather difficult to detect and delete it from the system. Unfortunately, other suspicious applications might use the same tactics, which is why we recommend being extremely cautious. The majority of similar programs enter the system when users click on fake Download buttons placed on the torrent and P2P websites. Thus, we suggest that you ignore such buttons and do not visit unreliable websites. You will be able to remove Wild Wild West Coupon without any problems if you use our manual removal instructions. Follow them step by step and this advertising-supported application will be gone. Do not forget to install a diagnostic scanner and then perform a full system scan in order to check whether there are no other undesirable applications on your computer. We recommend using SpyHunter scanner because it will definitely detect all undesirable applications. Click on the Download button placed below and an automatic download will start. Locate Wild Wild West Coupon on the list. Open the Start menu by clicking the Start icon. Quick & tested solution for Wild Wild West Coupon removal.